Sarkar (2018) Sundar Ramaswamy(Vijay) is an NRI who comes to India to cast his vote. But to his bad luck, his vote is cast by someone else. He files a case and requests back his vote and also demands there be fresh elections in the state. This does not go down well by the opposition party which tries to hunt him down. Upset with this, Sundar takes a decision to himself contest the elections. Rest of the story is as to how he faces all the corruption and comes out with flying colors in the elections. vijay and keerthi suresh are acting together ,murgudoos was directed very well and written this story also well ,from morning show onwards audience are crazy to watch ,first half is little slow and vijay enterance and other aspects are highlight ,so second half with action elements and all features comedy also good to watch so movie get a decent talk to watch .go and watch with familie . 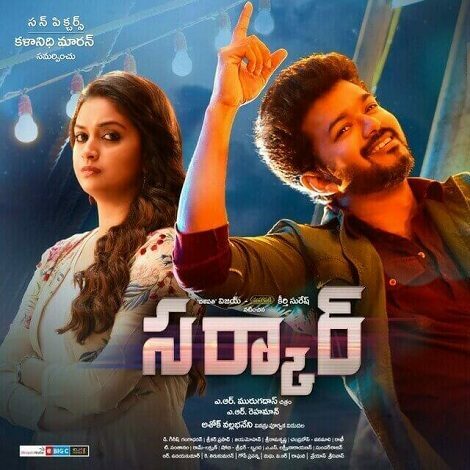 vijay is back on diwali ,with sarkar movie ,here movie is an oustanding story ,vijay action and keerthi suresh glamour makes movie a high level to watch so dorector murgudoos also directed well for vijay style so over all movie is get block buster talk so go and watch on big screen. sarakar ,a huge expectations of vijay fans and audience are satisfied with this movie on diwali time,action and political drama back drop was movie will go so comedy and vijay action all good to set for audience will accept so ,over all movie is an super hit . VIJAY is back with another action entertainer ,sarkar ,directed by murgadoss ,here moive is an action and poliical way ,keerthi suresh and varalaxmi sarathkumar ,other caste and crew are acting this big project .from telugu also vijay as audience to see so this diwali movie will be rock and get super hit talk.so hope movie will be a good hit . SARKAR vijay and keerthi suresh,are acting together and murugadoss was written this story and ,coming to story its an action and political drama .music by a r rehaman ,all and all big movie and big story audience are waiting to watch to this on festival time hope movie will be a huge hit. Sarkar' Suffers From Feeble Writing And Half-hearted Execution. Too Many Creative Liberties, A Weak.. Bottom-line: 'Sarkar' Starts Off Well But Ends As A Boring Political Drama. It Offers No Exciting Elements. Overall, “Sarkar” Is A Political Movie With Predictable Scenes And Decent First Half. It May Work For.. The Only Cinematography Is The Saving Grace Whole Keerthy Suresh And Varalaxmi Are Useless Without Any Impact..
Sarkar Is A Content Driven Subject Executed With Commercial Elements. The Film Lives Upto Expectations And Is..
SARKAR Is Very Strictly For Vijay Fans. This Film Has Been Designed, Executed As An Out And Out Political..
On The Whole, Its Out And Out Hero Based Movie. The Movie Is Recommended For Vaijay Fans. Tamil Version Must..